A week ago a friend hosted a private shakuhachi concert by another friend, Zak Braverman. A shakuhachi is a bamboo flute that superficially looks a bit like a recorder, but its sound is very distinctively Japanese. Zak's main skill is in producing a pasta sauce to die for, but this day's event tapped into his minor talent of being one of the best shakuhachi players in the world. Zak has appeared on my blog many times (such as here playing shakuhachi in an eclectic ensemble), but more often it's his kids Gen and Tamaki that appear. After playing one piece in the living room, Zak decided to switch to the adjoining washitsu (traditional Japanese style room with tatami grass-mat flooring) for its better acoustics, which is what you see above. 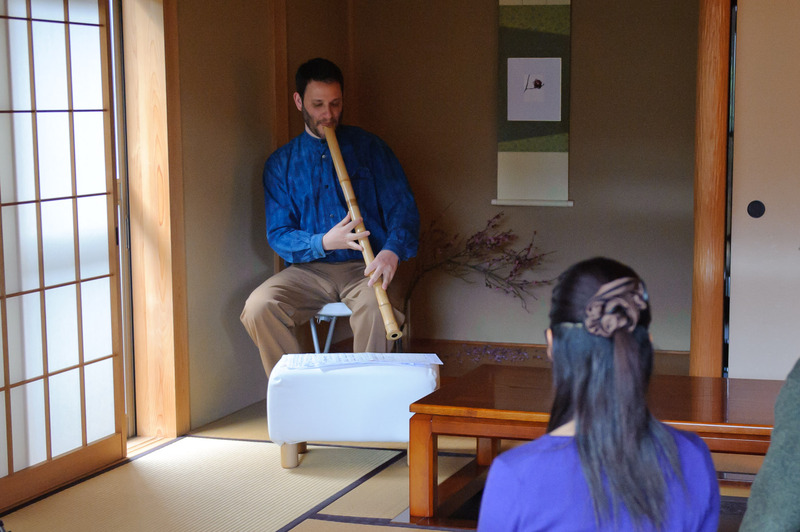 Shakuhachi come in a variety of sizes, and Zak used two during the concert; the picture above shows him playing very long one, more suited to some very old traditional pieces. This next piece is a modern one with a melancholy sound, which I prefer to the piece above because I feel it's more expressive. This is likely because my rough un-artistic ways can't grasp the subtle nuances of art, but in any case, with these poor recordings, there aren't much in the way of nuances to grasp, so take them with a grain of salt. As I said, Zak is one of the best shakuhachi players in the world, so if Zak and I ever make a proper studio recording that accurately reflects the sound, I'll update these files. What you’re hearing is the mix of the flute sound and the reflected room sound. Try putting the windshield on and recording closer to the flute. The tunes are still haunting and beautifully played. I love the timbre of them. What a great thing to hear live in person. I never got to when I lived there. Ahh, this is the sound that I hear in my head when I’m practicing martial arts, or in the shower where I do my best thinking haha. Thanks for the audio clips!